For many avid (and not-so-avid) gymgoers, the idea of being able to get a killer workout in the garage is like a dream. The good news is that if you have a garage with at least some space available then you can definitely turn it into your own private garage gym. There will be some costs obviously and take a bit of work on your part, but neither of those are serious obstacles. By the end of this guide, you’ll know exactly how you can turn your garage gym dreams into a reality. The biggest perk of a garage gym is undoubtedly the fact that you’ll be free of any membership fee you had to pay to go to the gym. 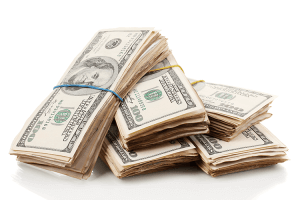 Sure, there will have to be some investment to get your garage gym up and running, but just do the math and see how long it will take you to recoup your upfront costs. It’s possible to set up a solid garage gym for about $500 to $1,000. If you’re paying $50 to $100 per month for a gym membership, you’ll have made that back in less than one year. Another advantage is that you won’t need to commute to the gym anymore. This means you’ll also save money on gas and the time that commute would typically take you. Working out at home is as convenient as it gets. You don’t need to find parking or wait for anyone to be done on the equipment you want to use. You won’t be dependent on fitting a workout into the times that the gym is open and inconvenient to your schedule. You’ll have an environment completely to yourself and free of distractions, and that can lead to more effective workouts. This depends on you and what your goals are. If you have enough space for a weight bench, a squat rack and the weights themselves, you’ll have the basics to complete a workout. 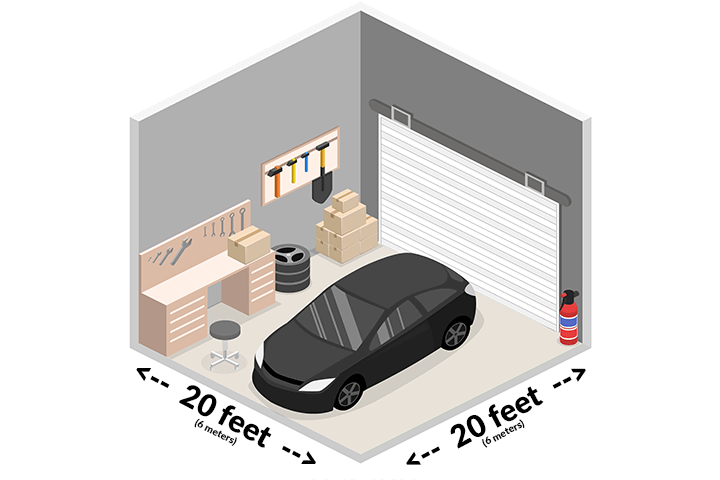 Average garage sizes are around 20′ x 20′. Break out your tape measure to see how much space you have to work with.On the other hand, if you prefer to go through a diverse range of exercises requiring various equipment and room to move, then you’ll obviously need more space. You also don’t want to be too cramped while you work out. If you’re worried about banging the barbell on your car while you do power cleans, then you don’t have enough space. You can probably determine if you’ll have enough space just by eyeballing it. If you’re not sure, look up the measurements for the equipment you plan to use, or something similar, online. Compare those measurements to how much space you have in your garage. If you want to get really detailed you can plan your layout using Google’s Sketchup. It is free 3D modeling software that has a huge library of household items. What Can You Really Do in a Garage? Most of what you can do in a regular gym can also be done in a garage gym. You’re only limited by the amount of space you have and your equipment. 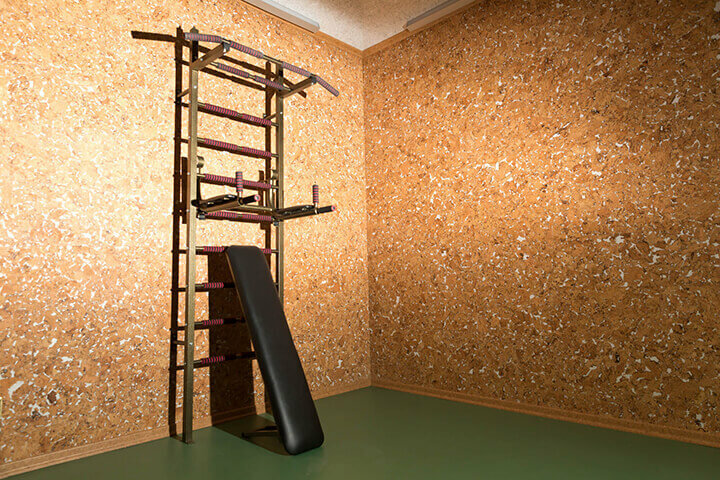 With enough room, you could set up various machines and other equipment, allowing you to do everything from cardio to heavy resistance training. Even with a basic setup with a weight bench, a squat rack, and a pull-up bar, you’ll have no shortage of exercises you can do to build muscle and lose fat. Now that we’ve covered garage gym benefits and a couple common questions, we’ll move on to building yours. It doesn’t make much sense to start moving equipment into your garage when you still need to clean it out so be sure you declutter first. This is the perfect opportunity to get rid of things you never use and don’t need anymore. Go through every nook and cranny of your garage and see what you find. Whenever you find something you don’t need, you should either sell it (which is a great way to get some money for this project), donate it or throw it out. You’ll likely get your garage better organized and clear up some space this way, meaning more space for your gym. Ready to Build Your Garage Gym? Okay! If you’re on board here are the five steps you need to take in order to move forward. 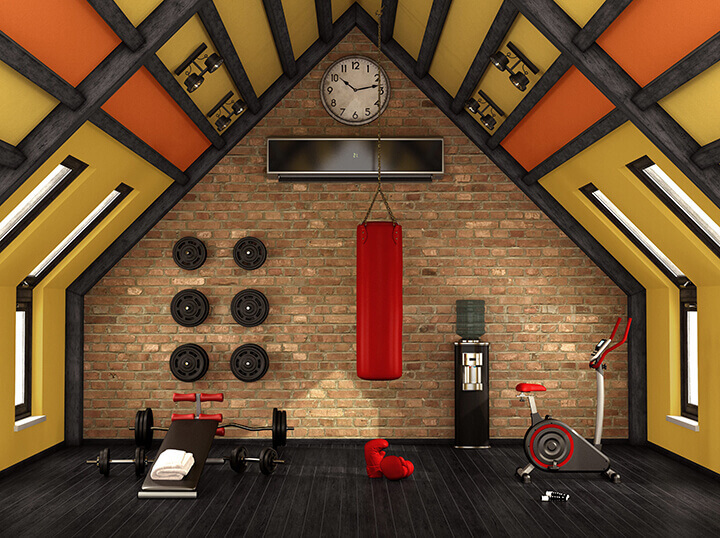 These are the two biggest factors in determining how you set up your garage gym. You need a gym that helps you train for your specific goals, and your budget affects what kind of equipment you can buy. You’ll probably want to start with your budget since that tends to be the easiest thing to figure out. It’s good to have at least $500 to invest otherwise you’ll have a tough time getting good equipment. This isn’t as important if you already have some equipment you can use or if you’re planning on a very Spartan setup for your gym. Get as specific as possible for your goals. Maybe you’re planning to do triathlons, CrossFit competitions or powerlifting. Or maybe you’re just wanting to get in better shape. Just make sure the equipment you choose can get you where you want to be. One challenge of training in a garage is that you have less control over the temperature and humidity than you do in the rest of your home. And while people often think that training in more difficult conditions will toughen them up, this can often be a pipedream. Forget about whatever you saw in the Rocky movies. When it’s winter and your garage is freezing, you’ll want to curl up under a blanket, not pump some iron. Depending on where you live, you’re probably going to need either a heater, fans, an air conditioner or all of the above. To keep costs down, you can purchase whatever you need for your current weather conditions first. So, your garage is ready for action now, and it’s time to get some equipment for it. If you can spend as much as you want on this project, then go ahead and buy whatever equipment you want. If, like most of us, you’re on a limited budget, then you should start by buying the essentials. 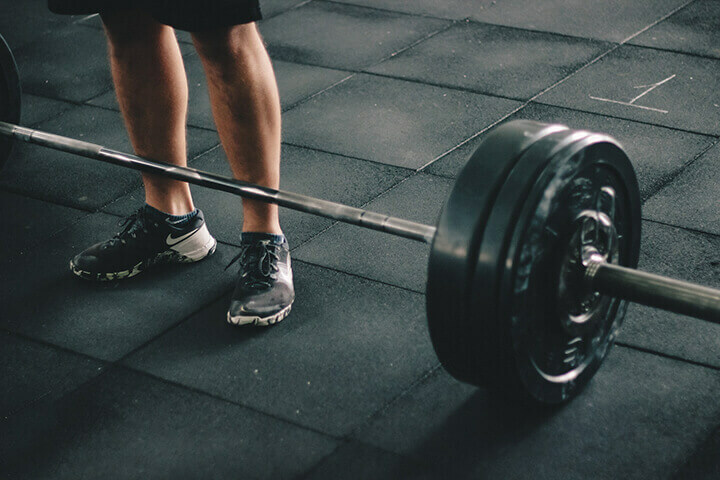 With this equipment alone, you can work out every muscle in your body and perform all the best compound lifts, such as the bench press, squat, deadlift and power clean. Weights are one of the biggest expenses, and how much you need depends on your size and experience level. If you’re a beginner or intermediate lifter, about 300 pounds is a good start. Of course, if you’ve done much lifting, you should already have an idea of how much weight you need. One type of equipment that you should probably avoid is the home gym machine that you’ve seen advertised on a million different infomercials. These are typically overpriced for what they offer, and they often don’t have enough resistance for serious lifters to get an effective workout. Buying gym equipment on a budget is tough. You need to find equipment that you can afford but if you get cheap, low-quality equipment, you’ll just end up needing to replace it sooner rather than later. Additionally. cheap equipment could negatively affect your workouts if it has a poor design or doesn’t perform properly. 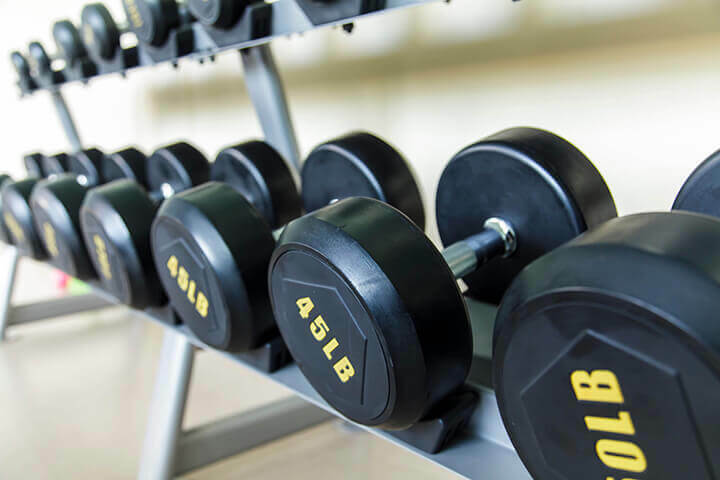 When it comes to gym equipment you can score the best deals when you buy used. Although eBay can be a good option what you save on the equipment, you often pay back in shipping. 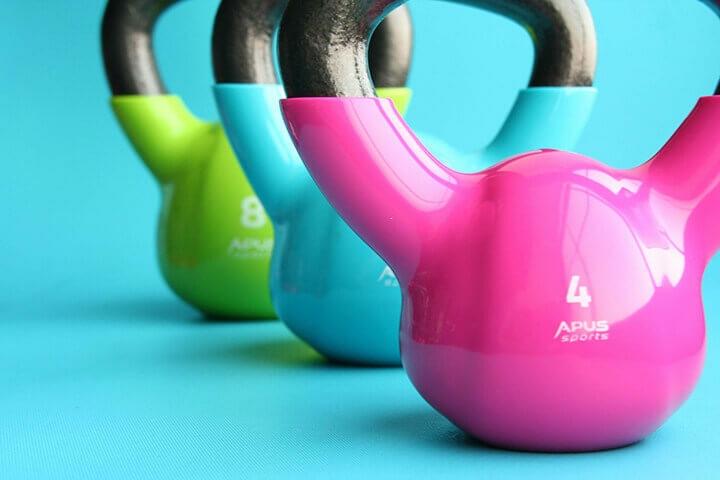 Craigslist is usually one of the top sites where you can find used gym equipment at affordable prices, especially if you know how to negotiate with people. Let’s be honest – people get gung-ho about working out all the time, buy a bunch of equipment, and then quit a few months later. Their loss can be your gain here. Make sure you check out some used gym equipment listings as you could find some amazing deals. Pull up and dip stationOnce your garage gym has some basic equipment spend a fair amount of time using it and then you can decide if it’s missing anything. When you feel like you could benefit from some new equipment and you have the funds available, start shopping. When you buy more equipment for your garage gym, it’s important to remember that your space is limited. If your garage gym turns into a cluttered mess it will be more difficult to get a good workout. Keep your gym’s available space in the back of your head as you shop for more equipment. Whenever you’re in doubt about whether something would fit, you’re better off not buying it. One thing you can do is cycle equipment in and out of your garage based on the type of workout you want to do. You’ll still need space somewhere in your home for any equipment you take out, though, and this only works with smaller equipment that you can move easily. You wouldn’t want to frequently move 300 pounds of weights or an elliptical machine in and out of your garage. Is a Garage Gym Worth It? Since you know what kind of work will go into creating your garage gym, you can decide if building one is right for you. It’s certainly a major project that requires an upfront investment, and no matter how nice your garage gym is, it won’t have as much different equipment as a typical gym would. Still, there’s nothing like being able to wake up, walk 30 feet and get your workout done at a gym you’ve built exactly how you want. Everyone who has a garage gym appreciates the convenience factor as well as how much money they save.